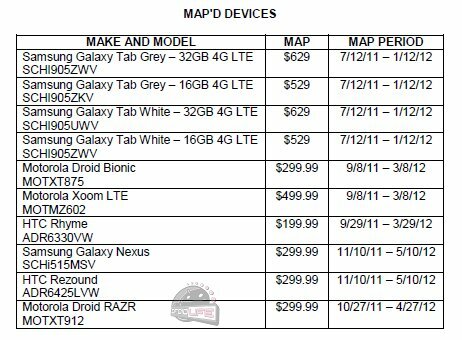 If you were looking for the most likely release dates for the Galaxy Nexus, DROID RAZR, and HTC Rezound, then this updated Verizon MAP (minimum advertised price) list is a good place to start. We saw a list similar to this just last week, but this one has been updated to included the newest device from Motorola. The RAZR (our hands-on) as you all know, will be up for pre-order on October 27 for $299, with pick-up availability happening some time in early November. The Galaxy Nexus was finally announced yesterday by Verizon, but just like the RAZR, no firm date has been set. As for the Rezound, we have no idea. We saw dates at one point showing this phone would be available in early October and then that just kept getting pushed back all the way through until we saw 11/10 as a possibility. Well, the 27th is next week. Hopefully we have a final date set at that time for the RAZR. Would also be kind of Verizon, Samsung or Google to let us know when the G-Nex would be out as well.